Ecopure | May our skin grow beautiful, as we grow wiser. The main ingredient is a patented ‘natural herbal complex’ which contains nine kinds of herbs : oregano, spearmint, lemon balm, chamomile, rosemary, lavender, bergamot, basil, Sage. All are ECOCERT certified. They are free of benzophenone, artificial colours, fragrances, animal ingredients and mineral oil therefore, perfect for sensitive skin! 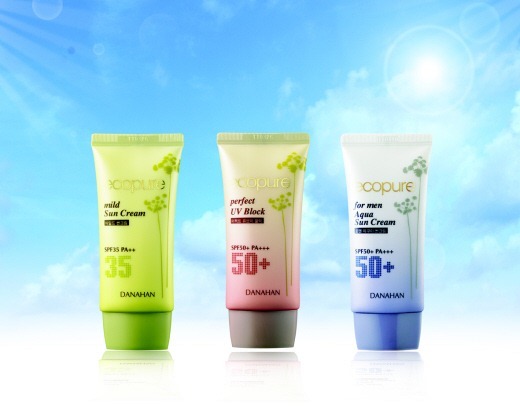 Somang’s ( which produces a couple of other brands such as Beaut Credit etc) Danahan has introduced a new eco-friendly line called the Ecopure line. Now it will introduce an entire line called the Ecopure Herb line featuring english herbs ( not the chinese medicine type of herbs ). The Ecopure herb line will contain 7 products toner, lotion, emulsion, essence, eye cream, cleansing foam and cream. It is ECOCERT certified and uses birch sap, mineral water that keeps your skin healthy and moist. The Ecopure Herbs line contains 66 – 92.4% of natural ingredients and will be priced at around 20,000 – 25,000 wons. Using nine kinds of major herbal ingredient complex – oregano, spearmint, lemon balm, chamomile, rosemary, lavender, basil, bergamot and sage – these 9 herbs work together to retent moisture and soothe irritated skin. It also contains antioxidants. It is free of 6 types of chemicals – animal ingredients, mineral oil, fragrance, artificial colors, parabens and benzophenon – therefore suitable for sensitive skin. To search, type 다나한 에코퓨어 on Gmarket. 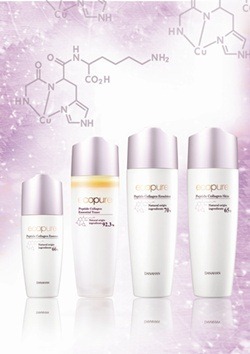 Beauty Credit’s Danahan natural skincare line – Ecopure – will be releasing a new anti aging line called Collagen Peptide. Danahan’s Ecopure Collagen Peptides consists of low molecular weight peptide complex that is easily absorbed into the skin to activate the collagen and improve it’s elasticity. 1) Palmitoyl Pentapeptide-4, also known as Pal KTTKS, Matrixyl or Palmitoyl Oligopeptide-4 – stimulates production of normal collagen thereby thickening the skin and plumping wrinkles from within. This peptide is available in products such as Hylexin ; StriVectin-SD. This line is also 100% ECOCERT certified and uses seven kind of home grown organic herbs to supply nutrition and hydration to the skin.